At the onset of golden hour, I was walking down Broadway Blvd. in Columbia Missouri where I’m currently working on two projects. I was taking some street shots as I religiously do, and started getting hungry. I knew what I wanted, the steak fajita nachos from a local restaurant in the downtown district. As I started walking towards the establishment, I noticed the closer I got to the restaurant the louder this music was getting. I was thinking to myself what the hell is that, who is playing that music so loud, as it’s usually kind of quiet downtown. I made a sharp right turn around the corner and instantly noticed an older model white van with all of its doors open using bungee cords to keep them from closing. 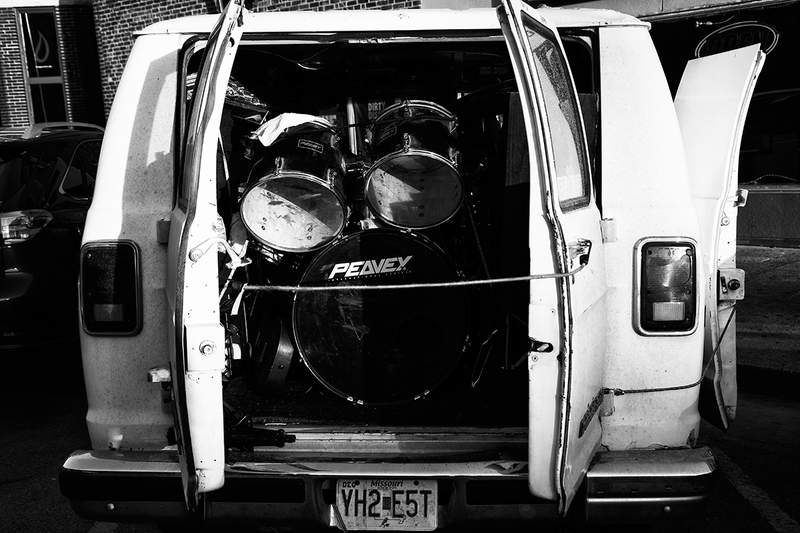 When I reached the rugged vehicle I noticed a man in his late 50’s playing the drums inside. Tom Sawyer by Rush was blaring with an overlay of the man drumming trying to keep time with Neil Peart. So I started shooting some shots. 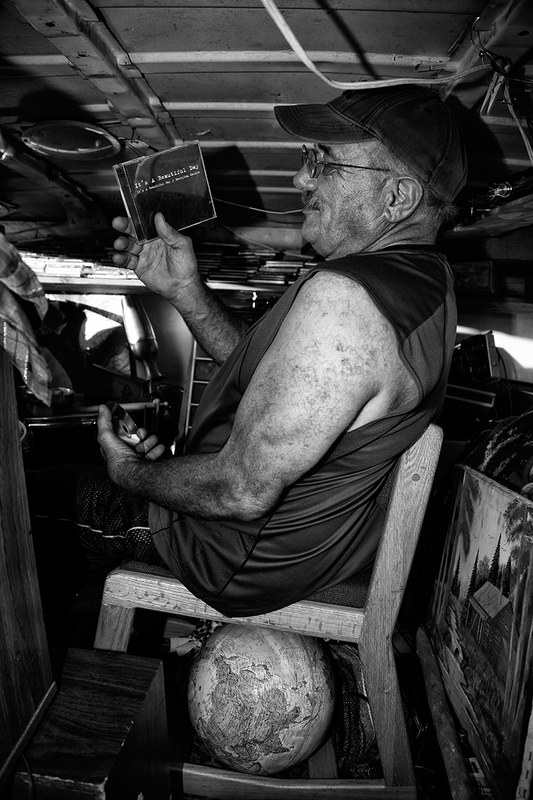 I stopped to talk to him when the song was over, and with a smile on his face he pivoted in his chair and turned down his radio. 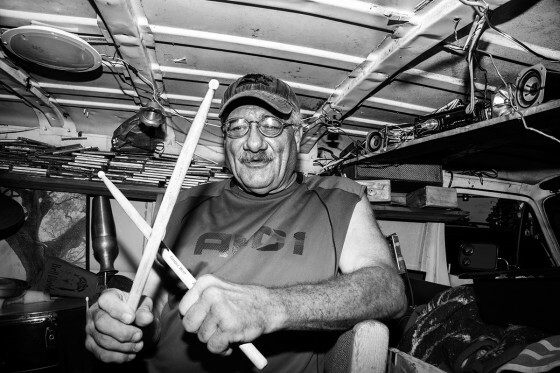 Without knowing it at the time, the strangeness of a man playing the drums in the back of his van was just the tip of this man’s adventure. 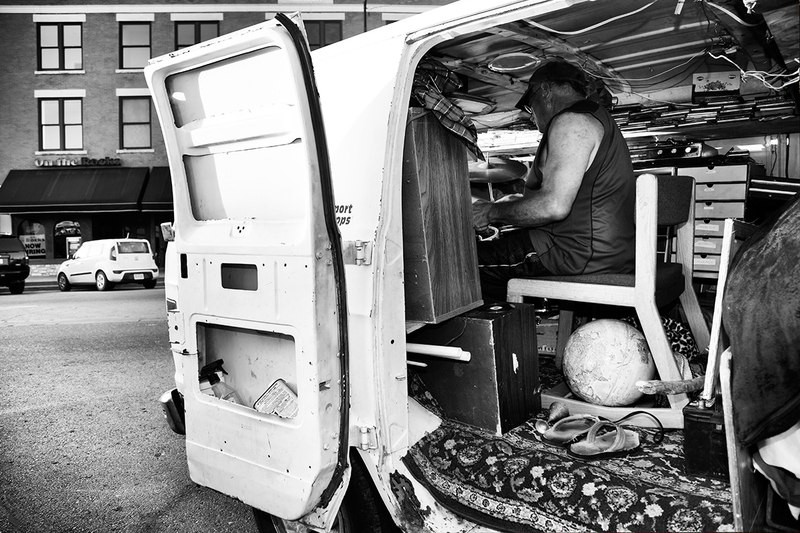 I was impressed by the unconventional masterpiece he had created in the open space of his van. 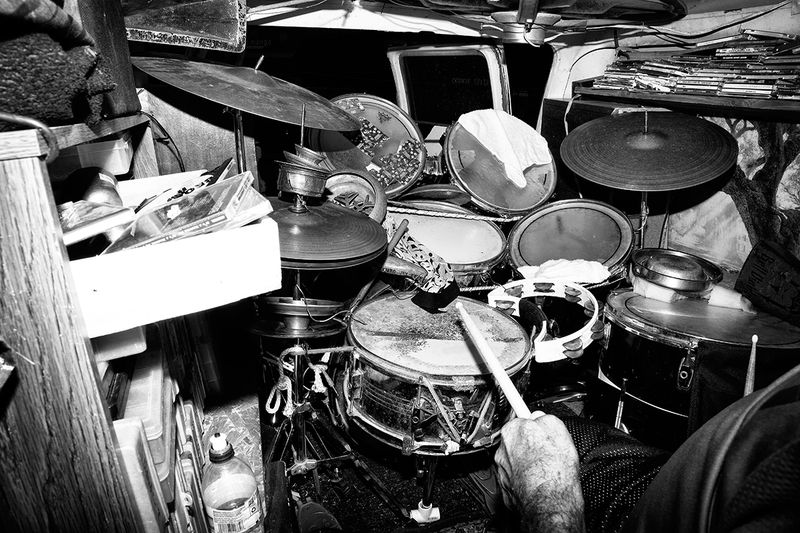 Not only did he have a full PV drum set, he had also collected random items from thrift stores to use as additional instruments he attached to the drums. 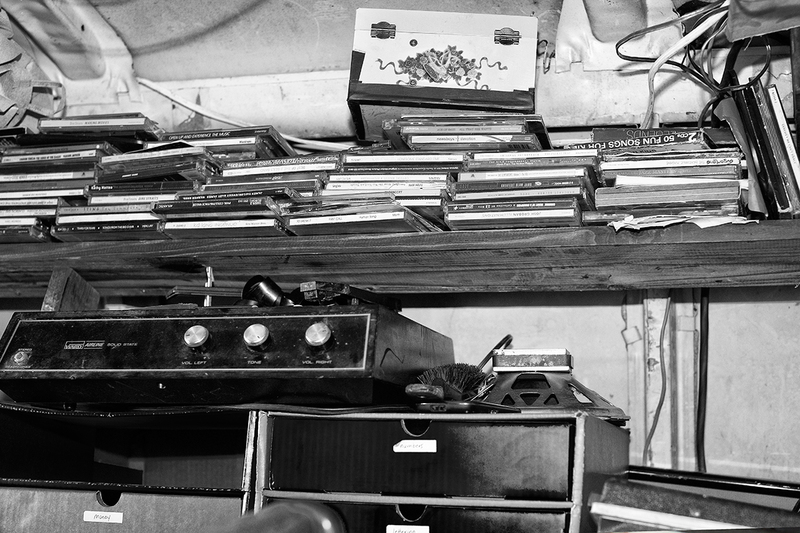 Along the walls he constructed wooden shelves where he stored nearly 500 CD’s and cassettes. 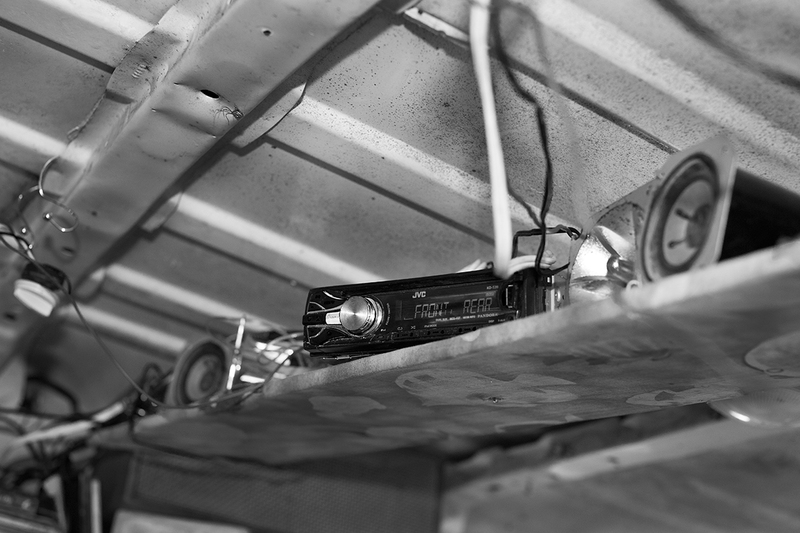 To create an optimal sound experience he attached so many speakers to the interior that I couldn’t even begin to count them. 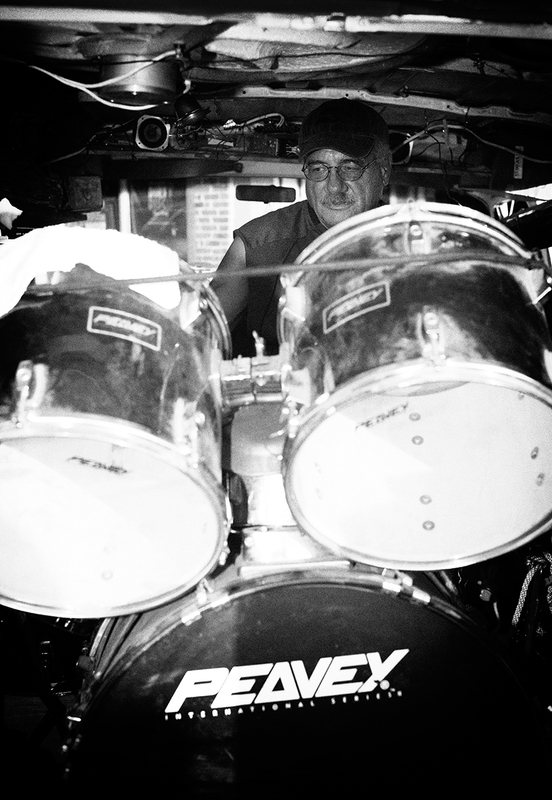 As passionate as he’s been about protecting and playing his drums, he’s equally as passionate about reconnecting with his distant family. His full smile quickly turned sadden as he explained to me that he was only able to fly to Germany once to see his daughter when she was in her early twenties. 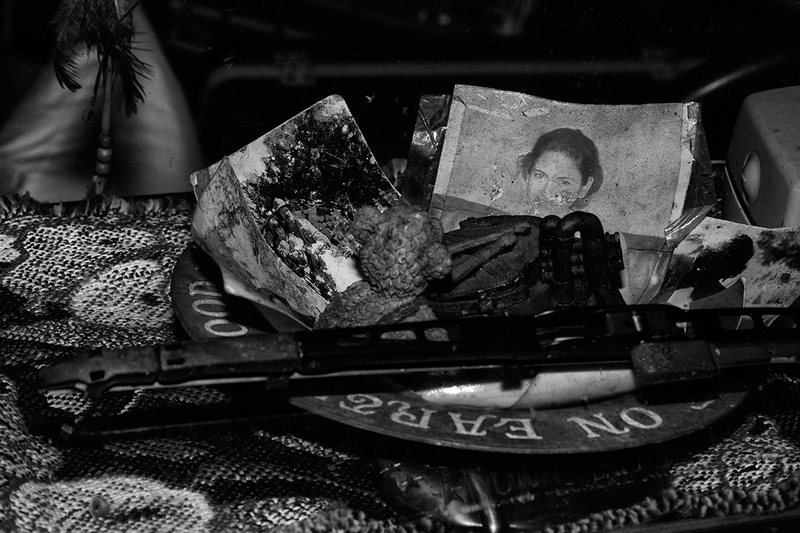 Unfortunately she was diagnosed with a terminal illness and passed away several month later. His life took a drastic turn for the worst when he suffered an injury three years ago. “I walked into a trailer hitch, it went from a little hole in my leg to almost eating my leg off. The doctor said if I didn’t put my feet up I was dead. I didn’t believe him, but a month later I was in the emergency room. I still have a rash I’m overcoming from that. It was wild where I didn’t even want to show my hands to anybody because they looked like the hulk. 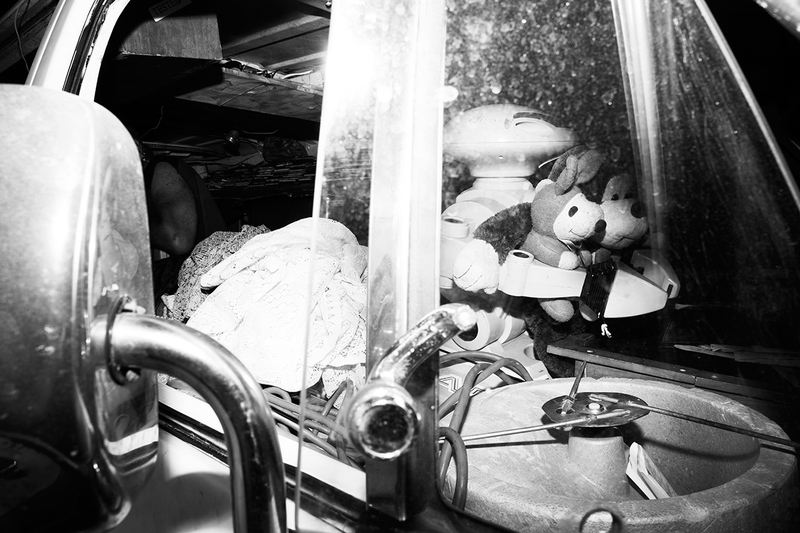 It was definitely warped looking, I think my immune system tried to make extra skin.” Now not only was Ray injured and unable to work, he was also left homeless after the winds of the Joplin tornado took the roof off of his trailer. 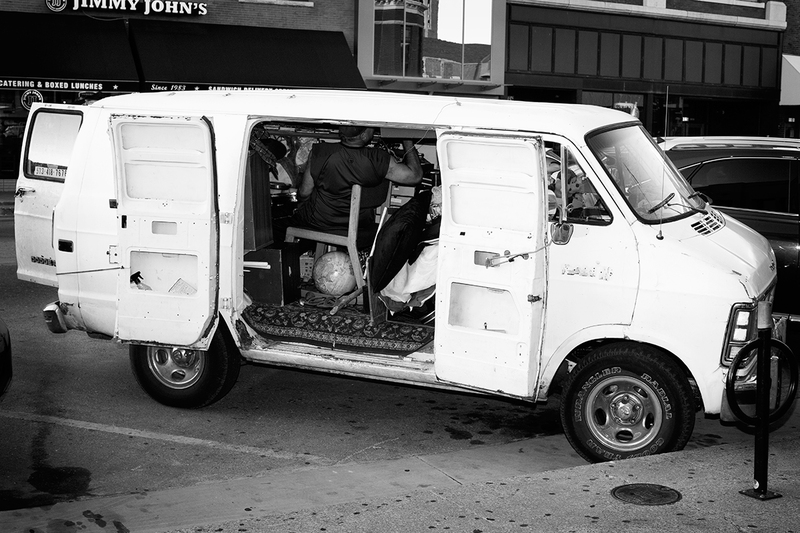 He explained to me why he parks at the same spot in downtown Columbia to play as much as he can. He’s been through a lot and still manages to keep his head above the water. After our stimulating conversation I went and enjoyed my nachos, feeling pleased as it always makes me happy to meet unique individuals. Four hours later, on my way home from shooting, he was still banging away. It’s so great to see people living life the way they want.